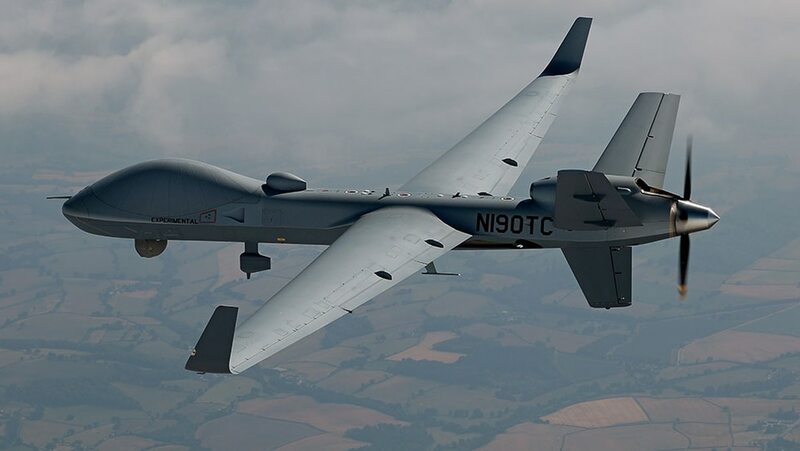 LONDON — The Royal Air Force struck a deal with General Atomics to fit critical detect-and-avoid technology to the fleet of Protector RG Mk1 remotely piloted air vehicles being developed to replace the United Kingdom’s Reaper fleet. While the contract has yet to be officially announced, the capability will "become part of the program in the very near future,” Group Captain Lyndon Jones, the Ministry of Defence Air ISTAR program director, told Defense News. Detect-and-avoid technology is critical to ensure safe flight in civilian airspace. Protector is being acquired and developed under a number of different contracts, and it is not as straightforward an acquisition as the parties involved may have hoped for. The comments were made during a Jan. 24 General Atomics event to announce three more British companies supporting Protector development. The vehicle is set to become the world’s first certified remotely-piloted vehicle to operate in non-segregated airspace. The British ordered 16 of the new Protector remotely-piloted vehicles and a number of ground stations in 2016. As many as 10 more vehicles could eventually be ordered by the RAF, according to information provided for U.S. congressional approval of the deal. The Protector is a quantum leap in drone capability for the RAF compared with the General Atomics Reaper fleet the British currently operate. The new remotely-piloted vehicle can fly significantly longer and hit harder than the Reaper. It will also be able to fly in non-segregated airspace. During the industry event in London, General Atomics announced that BAE Systems had signed a memorandum of agreement to support development on concept of operations for the Protector in U.K. airspace. The U.S. company also said MBDA and Raytheon UK were under contract to integrate the Brimstone 3 missile and Paveway 4 precision guided bomb on Protector. They join a lengthy list of companies contributing to the Protector program, partially funded by the British Ministry of Defence, including Leonardo, Cobham, Ultra Electronics, GKN and CAE. The inservice date of Protector has been delayed due to the ongoing financial difficulties of the MoD, according to General Atomics evidence to the Defence Committee. The British are coy about the timeline for the introduction of the Protector. Jones said only that the vehicle will enter service in the first half of the next decade. The contract for the British version of the MQ-9B Sky Guardian vehicle did not include a detect-and-avoid capability, although interfaces to accommodate the power, weight and size of equipment were. Confirmed plans to integrate the detect-and-avoid technology come after lengthy delays in ordering, which prompted concerns at General Atomics that the Protector would be unable to meet capability requirements. In written evidence to the British Parliamentary Defence Committee last year, the U.S. company said “failure to make appropriate provisions threatens to undermine Protector’s operational capability." "One of the platform’s key design characteristics is provision for the sense-and-avoid capability required to facilitate operations in non-segregated airspace…... MoD aspires to integrate such a sense-and-avoid system but it was not funded within the core program,” General Atomics noted. General Atomics has also been developing a maritime version of the Protector in hopes the British might have a requirement for an affordable platform to complement the nine strong fleet of Boeing P-8 Poseidon maritime patrol aircraft the MoD has on order. Jones said the maritime development is being tracked but there is no funding for it at this time in the 10-year equipment plan. “We are aware of the capability, I’m interested in the capability, but whether or not defense [leadership] will commit to it will be seen in the future," he said.